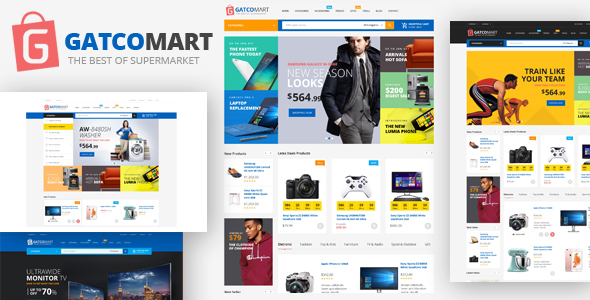 Gatcomart Megastore Shopify Theme is available in four different layouts. This theme is powered by lots of advanced features: Mega Menu, Vertical Megamenu Customer with pretty thumbnail image of each category, convenient Product Quick view and Product Image Zoom, advanced List and Grid products view, Google Font Support 600+, Responsive layout and many other features which help you to build an eCommerce website just in few minutes. Besides, Products Slider and Product Tabs Slider show new products, featured products, best selling products, sale products in suitable locations. Daily deals module allows the administrator to create timer-countdown for your products in the store. Overall, all of modules are displayed neatly for your customers to easily find the needed products. Let’s explore the amazing design and features of Gatcomart theme! Enhanced theme customization with sections! Our support team guarantees to respond you within 24-72 working hours from Monday to Friday. You can send us email to support@masstechnologist.com. We will process tickets and respond you to in the queue order.